Get Maxi Dresses starting at $27.65 New lower prices introduced. Dillard's traces its roots all the way back to 1938 when William T. Dillard opened his first department store in Texarkana, Arkansas. With several strategic acquisitions he was able to quickly expand across the country and first went public in 1969. Its primary locations have traditionally been in suburban shopping malls. Today the largest Dillard's store at 365,000 square feet (33,000 m²) is located at Scottsdale Fashion Square in Arizona. The company makes multi-billions in yearly revenue, with family members William T. Dillard II serving as chairman and CEO, and Alex Dillard as President. They employ over 38,000 people throughout the supply chain and other company positions. Dillard's targets a mid-range customer base with a strong focus on fashion clothing and accessories for Women, Men and Kids. They also stock a wide variety of everyday home items, such as Home Decor, Kitchen & Dining, Appliances & Electronics, Beauty & Cosmetics, Bedding, Luggage, and much more. Women's clothing includes Dresses & Skirts, Tops & Sweaters, Pants & Jeans, Leggings, Sportswear, Jackets & Outerwear, Suits, and Shoes. As well as Accessories, such as Lingerie, Handbags, Jewelry, Watches, Hosiery, Scarves, Hats, Gloves, Hair Accessories, Sunglasses, and Device Cases. The Men's range includes Casual & Dress Shirts, Ties, Hoodies, and Novelty items. There are also similar selections for Kids and Juniors. Depending on the Dillard's coupon codes available at the time you may be able to get money off items in all categories, or specific items only. Clicking a coupon at Coupofy will reveal further details. 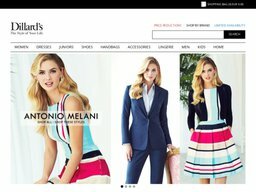 Dillards.com is very easy to use, allowing shoppers to browse via the above categories or use the search bar if they have something specific in mind. You can also shop via brand, and there are literally hundreds to choose from. The Price Reductions section will help you find a bargain, and these can be compounded by redeeming a Dillard's coupon code. To help you make a purchasing decision product listings can be easily refined by subcategory, brand, price range, color, size, popularity and other parameters. There are also handy user ratings and reviews. If you are shopping for somebody else and aren't sure what to get them, you could also buy a gift card which the recipient can then use to make their own purchasing choices. The site uses a standard basket and checkout system. Dillard's accepts all common credit and debit cards for payment, including Visa, American Express, Mastercard, and Discover. You can easily pay and check out with Paypal. International customers will have to go through the Borderfree system, but can still use a card or paypal. Dillard's also offer their own branded rewards credit card which you can apply for an manage online. This gives you points for every order which can be used later to get a discount. You can also get a discount by redeeming Dillards coupons. You can do so by entering the code in to the promo box before checkout. If valid you should see a confirmation message and your total order cost drop according to the offer. If using in person Dillard's department store coupons, you must show them to the cashier. Their own branded gift cards are also accepted for payment, and these can cover all or part of your order, the remainder which must be covered by another accepted payment method. 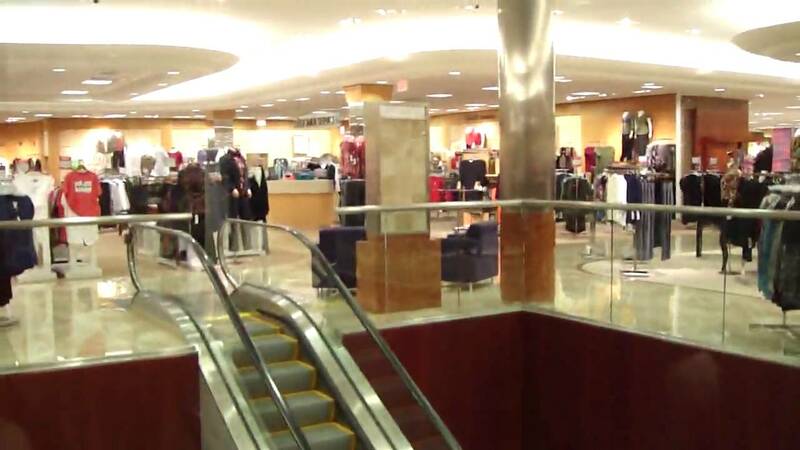 Dillard's ship both domestically in the United States and overseas using the Borderfree system. In the US shipping is determined by the value of your order and the speed at which you want it to be delivered. To get an accurate calculation you should add items to your basket, enter a delivery address and choose your desired method. From time to time free shipping is available through the redemption of Dillard's coupons. If so you should see this alongside all the other coupons here at Coupofy. High value purchases will only be shipped via an Expedited Service and will require a signature. Standard shipping costs $8.50 for orders up to $14.99 and $11.95 thereafter. For Expedited it's $18.50 and $21.95, and Next Day is $28.50 and $31.95. Gift Cards ship by standard for free. Dillard's operate a 30 day return policy, allowing customers to return any item no questions asked within 30 days of the purchase date, for a refund or store credit. Items must be in their original condition with all the tags and packaging still in tact to be accepted. You will also have to cover the original and return shipping costs unless you received items in error or they were defective upon receipt. Personalized items and clearance items marked down 65% or more cannot be returned. Dillard's, 600 Carnahan Drive, Maumelle, AR 72113.